I haven’t posted anything on my blog for a while. My excuse is that I was so busy at work, however I never stop cooking I just don’t have time to write my blog, that’s all. I also post a lot of photos on Instagram. The good thing about Instagram is that by writing a short description and quickly posting the photo I know straight away who likes my food. You can find me @charinyas_kitchen. 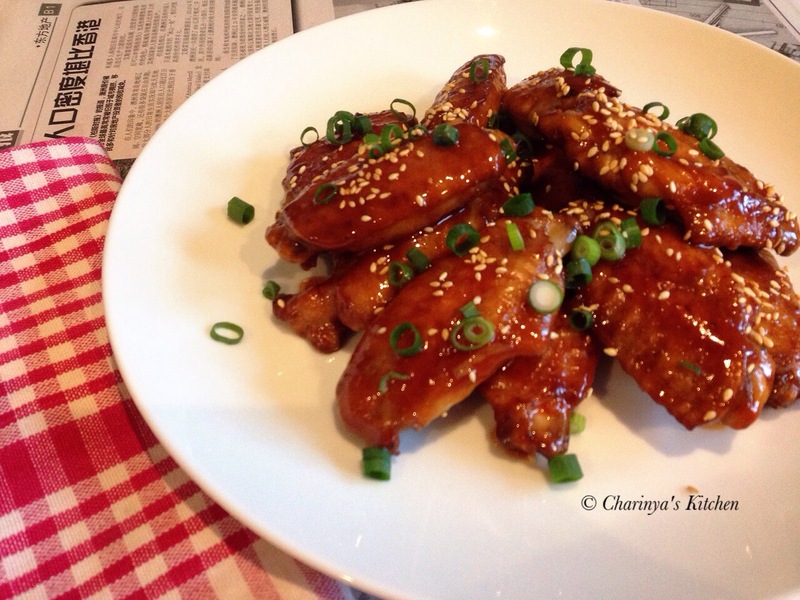 The recipe I would like to share this time is “Sweet ‘n’ spicy Sriracha wings”, with the recipe from taste.com.au magazine and using Marian Gasby’s recipe. Sriracha sauce is a spicy chilli sauce from Thailand that is now in use around the world. Thai people use it as a dipping sauce. I remember eating it with chips. You will see Sriracha sauce in many Vietnamese restaurants as a condiments for rare beef noodle soup (Pho). Do you know Sriracha is a district in Chonburi (about 1 hr. drive from Bangkok)? This is where the factory is located. Let’s have a look at the recipe. • 1.5 kg chicken wings cut in half at the joint. • Place garlic, ginger, soy sauce and oil in a large sealable bag then add chicken pieces to marinade. Place in the fridge for up to 2 hours to marinate. I don’t have a bag so I did marinated in a bowl instead. 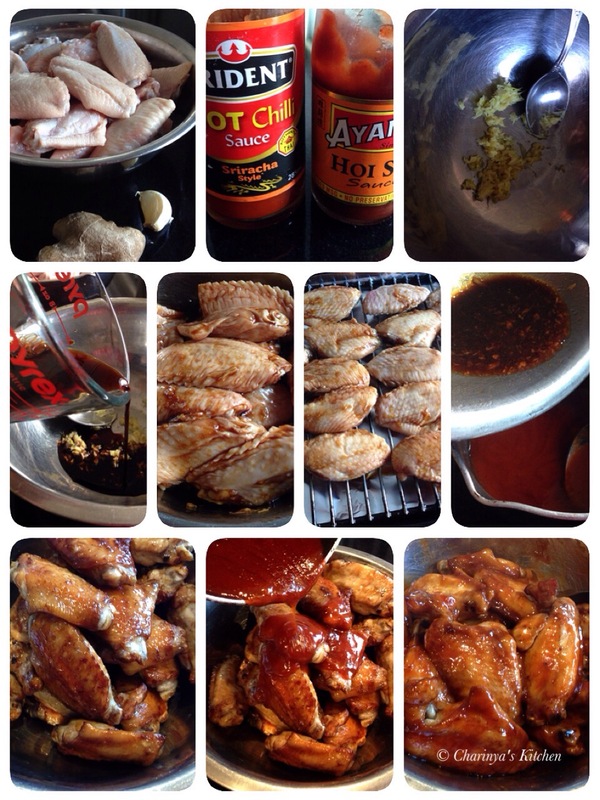 • The recipe said to BBQ but I grilled in the oven for around 20 mins, saving excess marinade. • While waiting for the chicken to cook make the sauce by combining the saved marinade and sauce ingredients in the saucepan. Bring to the boil and reduce the heat. Simmer for 2-3 mins. • Pour the sauce over the cooked chicken wings. Toss the wings through the sauce. 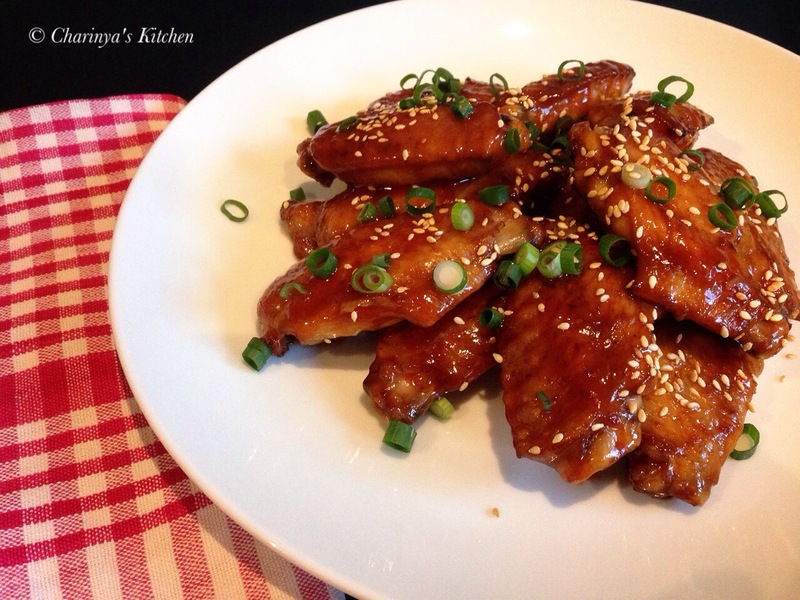 Pile the wings onto a serving plate and sprinkle with sesame seeds and spring onions. ‹ PreviousFried king mackerel with green mango (Apple) salad.